Sour cream is a dairy product made of fermented cream. By adding bacterial culture to fresh cream, it naturally thickens and sours the cream. Sour cream is rich in fat, and is widely used as a topping, a dip and helps thicken sauces and soups. Some sour cream versions now have introduced light and non-fat varieties. White creamy substance that's easily compared to ordinary cream. 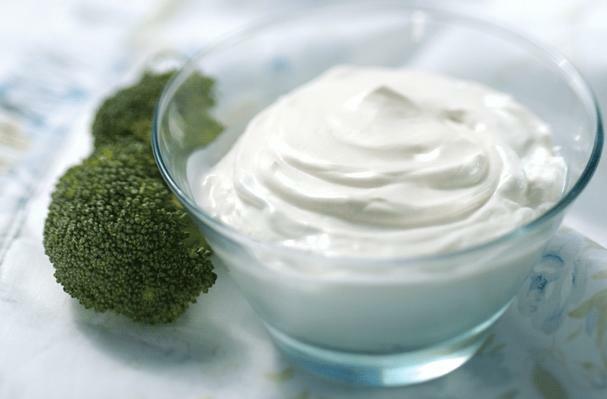 Sour cream differ from ordinary cream by means of culturing specific kind of lactic acid bacteria in it. Choosing: Check the expiration date on the container before buying. Do not buy Sour cream with broken, torn or damaged container. Sour cream with visible mold should be discarded, as it may be contaminated below the surface and could contain dangerous mycotoxins and aflatoxin. Buying: you can get sour cream at any local or supermarkets. The uses for sour cream are varied. It adds a tangy, gourmet flavor to appetizers, soups, sandwiches, salads, meat dishes, vegetables, baked foods, candies and desserts. Use it in baking and cooking, or enjoy it as it comes from the carton. Because of its milk fat content, sour cream adds richness to baked products. In fact, dairy sour cream can replace some of the fat and milk in recipes such as pancakes and biscuits. It also gives distinctive flavor to cakes and cookies. Sour cream should be refrigerated as soon as you get it home from the store. Sour Cream: used primarily in the cuisines of Europe and North America, sour cream is often used as a condiment. It is a traditional topping for baked potatoes, added cold along with chopped fresh chives. It is used as the base for some creamy salad dressings and can also be used in baking, added to the mix for cakes, cookies, American-style biscuits, doughnuts and scones. It can be eaten as a dessert, with fruits or berries and sugar topping. In Central America, crema, a variation of sour cream, is a staple ingredient of a full breakfast. Sour cream can also provide the base for various forms of dip used for dipping potato chips or crackers, such as onion dip. In Tex-Mex cuisine, it is often used as a substitute for crema in nachos, burritos, taquitos or guacamole. It is one of the main ingredients used in Beef Stroganoff.